On my first visit to Oregon in late 2007, I could not take my eyes off Mount Hood, unless it was to gape at Mount St. Helens, or maybe Adams or Jefferson. I grew up in the mountains of Virginia — what I've since learned native Oregonians would refer to as "foothills." The Blue Ridge Mountains were the backdrop of the first two-plus decades of my life. I'd traveled to the Rockies as well, and to me they seemed to stand above the west the way that the Blue Ridge stood above the east — only pointier. The Cascades are different, though. The volcanic peaks that rise high above the rest of the mountain range every 50 miles or so are like giants. The Rockies are taller, sure, but they're ALL tall. Oregon's peaks are exceptional because of the way they stand alone. I've always thought that Mount Hood seems to stand guard over Portland. This mountain is, in my opinion, the most stunning element of our gorgeous city. 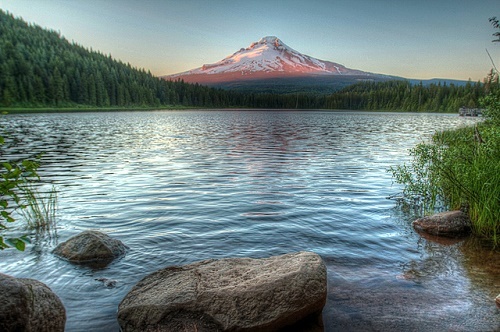 Over time, I fell in love with nearly everything about Portland, but it was Mount Hood that drew me here, 2800 miles from the Blue Ridge foothills I once called home. A view of the mountain was a prerequisite for my home here in Oregon. It doesn't always show itself from behind the clouds, but on clear mornings when I first wake up to see the sun rising behind Hood, it still takes my breath away, seven years after my first encounter.